LONDON • Close by Westminster Bridge and the Houses of Parliament, there stands the statue of a woman brandishing a spear. Erected in 1902, it portrays Boudicca, the warrior queen who, in the words of the inscription on the statue's plinth, "died AD61, after leading her people against the Roman invader". As Britain prepares to vote next month on whether to leave the European Union, the story of Boudicca serves as a reminder that the tradition of British euroscepticism is an ancient one. Her statue, complete with rearing horses and a chariot armed with scythes on its hubcaps, seems to capture the spirit of Brexit. It is also a reminder, though, that belonging to a European superstate can bring benefits as well as drawbacks. The location of Boudicca's statue, in the heart of London, right by the seat of government, is not without its ironies. It was the Romans who founded the British capital: Londinium. Boudicca's sole contribution to its development was to massacre its inhabitants and raze it - a calamity for the city that ranks with the Great Fire and the Blitz. Although her uprising was soon crushed by the Roman legions, her presence next to the Houses of Parliament is, in a sense, as inappropriate as a statue of General Sherman would be outside the Capitol in Atlanta. How do the British principally identify themselves: As an island nation or a European people? This question, which lies at the heart of the referendum on whether Britain should quit membership in the European Union, is one tortured with ambivalences. In Latin, Boudicca meant Victoria - so perhaps it was only fitting that the statue of the queen who defied the Roman Empire should have been given the face of the monarch who presided over Britain's own imperial heyday. Classically educated, patriotic Victorians - even as they revelled in their country's glorious isolation from the continent - found it hard not to identify the British Empire with the Pax Romana. Many, as a result, were predisposed to view the defeat of Boudicca's attempt at Brexit as a thoroughly good thing. Typical was Francis Haverfield, an eminent archaeologist who was the first to examine closely how Britain, under occupation by Rome's legions, had been absorbed into the Roman order. In 1905, three years after the statue of Boudicca had been winched into position, Haverfield declared himself on the side of the invaders. "Whatever their limitations," he wrote, "The men of the Empire wrought for the betterment and happiness of the world." Such a perspective, even in this post-colonial era, has not disappeared. A decade ago, Mr Boris Johnson, a leading Conservative member of Parliament and, until this month, the mayor of London, published a book titled The Dream Of Rome. In it, he argued that, like the United States, the Roman Empire had served as a great melting pot in which peoples of every conceivable background came to share a common citizenship. When Mr Johnson wrote that "the European Union can be seen as the inheritor of the Roman Empire", he meant it. 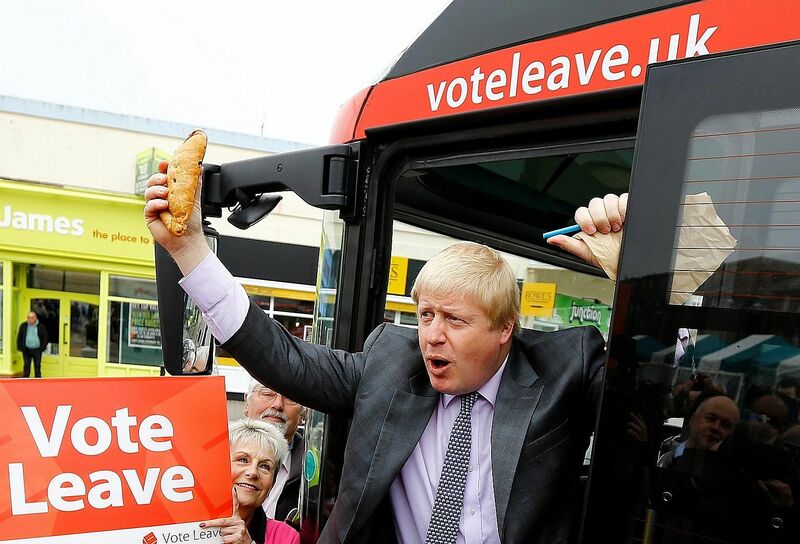 Now, against the backdrop of a referendum campaign, Mr Johnson has emerged as the most high-profile enthusiast for Brexit. No longer does he propose that a more Roman-style union would be better for Europe. Instead, he recently denounced the attempt to unite the nations of Europe within a single superstate as a formula for disaster, and predicted that it would doom the Eurocrats of Brussels and Strasbourg as surely as such imperial ambitions had doomed Napoleon and Hitler. The contradictions in Mr Johnson's attitude to the Roman Empire are bred, perhaps, as much by geography as by his own wilful and mercurial character. Just as Mr Charles de Gaulle once warned against admitting Britain into the European Union's predecessor, the Common Market, on the grounds that, as an island nation, Britain would always look to the sea, so Roman ethnographers regarded the Britons as a people apart. The catalogue of their barbarisms, from their florid body painting to their taste for milk, even made Rome's imperial strategists doubt the value of conquering them at all. Even when, in AD43, they finally decided on an invasion, the advance of the Roman legions was ultimately blunted by the increasingly inhospitable landscape and the savagery of the natives. As a result, the northern outposts were always heavily - and no doubt oppressively - militarised. Historians have aptly described the occupation of the north as Rome's equivalent of Afghanistan, resistant to all attempts at subjugation. Hadrian's Wall still stands as a memorial to the failure of the Caesars to subdue the rebellious Picts. Farther south, however, classical civilisation gained a greater hold. From their Continental masters, the native aristocracy acquired a taste for baths, mosaics and central heating; the villas they built during the third and fourth centuries were tributes to Roman taste. And yet, even these acculturated Britons remained to some degree outsiders. Unlike their counterparts in Spain and Gaul, they did not enter the highest echelons of imperial society. As late as the mid-fourth century, by which point Britain had been a Roman province for 300 years, the very notion of a cultured Briton could generate snorts of derision. "There's no such thing as a good Briton," one Roman author declared, after a British poet had dared to give him a bad review. Britain would soon become notorious for something far removed from literary criticism: armed insurrection. "Fertile in rebels", early Christian theologian St Jerome wrote of the island. By the time he did so, in 415, Britain's status as the troublemaker of the Roman world was firmly established. As early as the third century, one insurgent leader declared himself the emperor of Britain and northern Gaul; and in 383, another British warlord crossed the Channel and ruled as emperor in Gaul for five years. By the early fifth century, it was evident that the imperial authorities, struggling to cope with mass immigration and economic upheaval in their own heartlands, had lost control of Britain. It is possible that they opted deliberately to cut the province loose; but the evidence points to a more startling conclusion. The Britons, so we are told by a near-contemporary historian, "threw off Roman rule, and lived independently, no longer subject to Roman laws". So, Britain, uniquely among the provinces of the Roman Empire, seems to have chosen exit. The immediate consequences of this decision verged on the apocalyptic: The British economy imploded, villas and cities were abandoned to weeds, and the province was carved up among warlike tribal invaders. On the other side of the ledger, the upheaval proved, in the long run, to be the making of the English language, the common law and cricket. That the stakes in June's referendum are less high can be reckoned, no doubt, a positive. For all that, though, it is not wholly implausible to see in Britain's status as a reluctant, rebellious, only partly tamed member of the Roman Empire a mirror for our present choice. As it might have been expressed in Latin, "Brexit quondam, Brexitque futurus" - our once and future Brexit. •Tom Holland is a historian and the author, most recently, of Dynasty: The Rise And Fall Of The House Of Caesar.